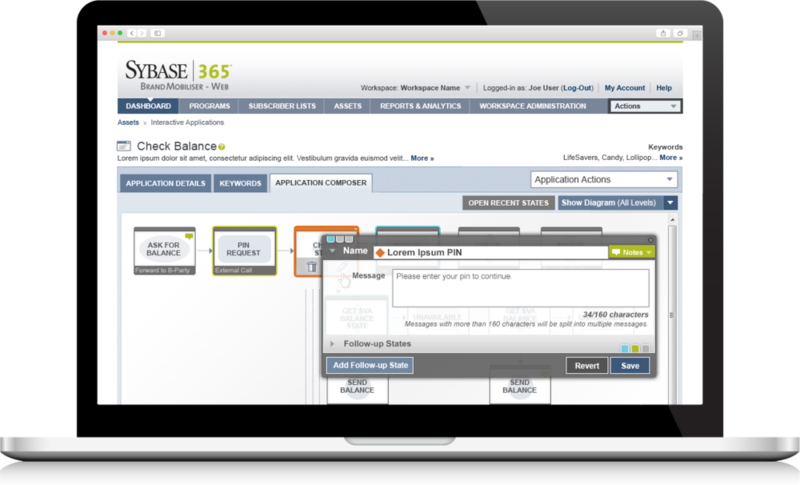 Sybase's mobile division, Sybase365, had two powerful mobile marketing tools that they recognized would be more widely-used if they were made more usable and merged into one under the Brand Mobiliser name. The first application allowed marketing managers to create and launch mobile CRM campaigns. While the second application, the Application Builder, offered compelling functionality, but could only be used by Sybase's internal Engineers. The Application Builder creates complex interactions between various back-end systems, which ultimately allows consumers/end-users to send keywords to short codes to perform a variety of actions, such as paying for parking or checking their bank balance via SMS. Sybase approached Busse Design to help them rearchitect both applications so that they would fit together in a logical and cohesive manner, and redesign each application so that would be easier to use. After extensive Discovery sessions with Sybase, Busse Design provided a detailed Application Map to rationalize the overall architecture of the newly merged applications, calling out specific user roles and all starting points for user workflows. We then worked with Sybase to create a new interaction model for the Application Builder so that it moved from Engineering-centric display of nesting if/then statements to a more user-friendly diagrammatic display. After working with Sybase to provide various interaction flows and screen templates, we provided functional front-end HTML Templates to allow Sybase's developers to integrate the design with their application quickly and easily.